Presenting Brandan Holiday (center) with his degree are Gregg J. Hesterman (left) colonel 178th wing, base commander; and Heidi A. Bunker, command chief master sergeant of 178 wing. Staff Sergeant Brandan J. Holiday recently received a degree from the Community College of the Air Force during a ceremony at the Army/Air National Guard Base in Springfield. Holiday received an associate degree in applied science – criminal justice. Holiday is a graduate of Hillboro High School and the son of Debbie S. Holliday of Hillsboro. The Community College of the Air force (CCAF) was officially established on April 1, 1972 offering only certificate programs. Realizing CCAF standards exceeded the minimum associate degree programs in civilian community colleges, the Air Force sought degree-granting authority. On July 14, 1976, President Gerald R. Ford signed Public Law 94-361 authorizing the Air Force –Air Education and Training Command (AETC) commander to confer the associate degree. The CCAF partners with more than 108 affiliates Air Forces schools, 82 education services offices located worldwide, and more than 1,500 civilian academic intuitions. The program serves more than 300,000 active duty, Air National Guard and Reserve enlisted airmen, making CCAF the world’s largest community college system. The programs combines the technical education offered by the Air Force schools with core of general education from regionally accredited civilian institutions, and management education from Air Force or civilian sources. The college annually awards more than 22,000 associate degrees in applied science degrees from 68 degree programs. As of August 2017, it has awarded 512,209 degrees to 415,922 graduates. Submitted by Bethany R. (Posey) Watson. 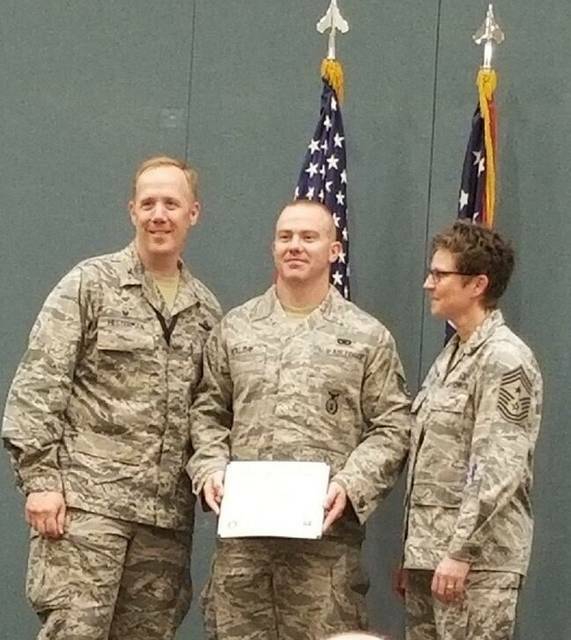 https://www.timesgazette.com/wp-content/uploads/sites/33/2018/08/web1_Military-pic.jpg.jpgPresenting Brandan Holiday (center) with his degree are Gregg J. Hesterman (left) colonel 178th wing, base commander; and Heidi A. Bunker, command chief master sergeant of 178 wing.